Shipwrecks usually bring misfortune and despair, but in the annals of the clipper ship Frolic, good fortune blossomed from a frivolous mishap. Edward Faucon, an experienced captain who piloted his ship on the Canton, China, to Bombay, India, route for years, simply misjudged the distance between his vessel and shore. It was a misty day July 24, 1850, when Capt. Faucon ran the sailing brig Frolic over the reef just north of Pt. Cabrillo, California, on the Mendocino coast. Settling in a cove now designated as state property, the ship foundered in the shallow water as all hands scrambled safely to shore. Dubbed the “most significant shipwreck in California history,” by maritime authority Don Marshall, the Frolic’s story was researched and written by Dr. Thomas Layton, head of the Department of Anthropology, San Jose State University. The wreck’s significance came from word spread by the survivors and later from salvors who raved about the “magnificent redwood forests” in the area. Salvage attempts failed, but as a result of “word getting out,” entrepreneurs found the forests. This led to the discovery of the gigantic sequoias and emerging towns and mills in the area and other parts of the Mendocino coast. In 1984, Dr. Layton and his students found pottery fragments among Pomo Indian remains located between Ft. Bragg and Willits. 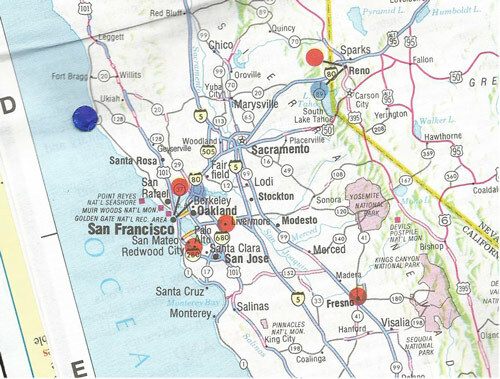 The indigenous Pomo Native American tribe occupied northern California for hundreds of years. Puzzled by chards of Chinese porcelain found with the pottery, Dr. Layton found some answers when he met some divers on Big River Beach at Mendocino. They showed him similar shards salvaged from a wreck they presumed was a Chinese junk discovered in the early 1960s in 10 to 30 feet of water. It took him 10 years, but Dr. Layton put together a fascinating account of the Pomo Indians, Chinese maritime commerce, the opium trade and the wreck of the Frolic. 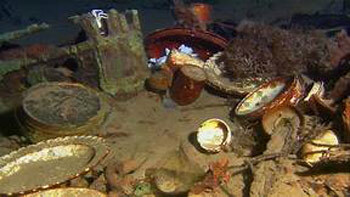 Divers retrieved many artifacts from the wreck over the years, most of them donated to local museums. Based on Dr. Layton’s archaeological surveys, the Frolic was officially documented in 2003 and designated a California Underwater State Park. In retrospect, it seems to be an appropriate honor for a shipwreck which launched an industry which produced thousands of homes in hundreds of cities that sprung up in California and the rest of the country. Note: Exhibits and artifacts from the wreck of the Frolic are on display at the Mendocino County Museum in Willits, the Pt. Cabrillo Light Station, the Kelley House Museum in Mendocino and Headlands State Park. Thanks for the awesome article, we have similar stories about ships that ran onto the Washington Coast. Thank you Capt. Allen. I got caught up in researching the Frolic. 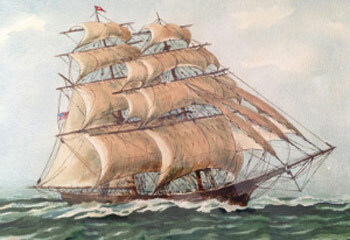 It really hit home when i discovered this beautiful clipper ship was built in my hometown: Baltimore, Maryland! Yes, your Washington coast has some fascinating shipwreck stories as well. There was a lot of action on those northern coasts in the early days. I love your story about the Frolic. Do divers still go on it? Thank you for your kind words. As you read in my article, the site is designated an underwater state park and protected from further salvage. You could make it a “bucket list dive” and take a look at the sparse remains. Archaeology students could still go there but I think their basic studies ended a good while ago. I was born and raised in Baltimore County and spend a great deal of time on the Chesapeake Bay. I find stories of the vessels built in Baltimore fascinating. Thank you so much for this article, I thoroughly enjoyed it! Thank you Sandra. What you say is very interesting. In my research of ships, shipwrecks, ports of call, etc. I found Baltimore popping up in many write-ups. It was not only a major port, but a shipbuilding (clipper ships & others) haven as well. And the Chesapeake Bay remains a fascinating entry to a grand old port. Still at it EB, way to go. Treasure Island is now a luxury resort a far cry from when we explored it; uninhabited 50 years ago. Hang in there! I just read your article on the Frolic and found it fascinating. I am currently listening to the audio version of Clive Cussler’s book The Sea Hunters II. It is so cool to learn about all of these old ship wrecks. Keep up the awesome work. Staci: Thank you! You made my day! Yes,Clive’s books are fascinating. I was the featured speaker at his Collectors’ Society/fan club convention in Scottsdale a few years ago. If you go to Google,you might be able to bring up my talk by going to Ellsworth Boyd talk. It is in 3 installments. I think you will like my article for April, coming up soon. It is all about the Cyclops, a Navy ship that disappeared 100 years ago and has never been found. Thanks again. Cheers, E.
Hi Pete: Good to hear from you. Yes, what you call Treasure Island is Paradise Island, Nassau, and the area where we camped is now all developed. We saw it in its pristine condition. It is overrun with tourists now. Hope all is well. Cheers, E.
It’s interesting that the Frolic was sailing the same trading routes that were involved in the mid 19th Century Opium Wars between China and Great Britain. After burning down the White House and their subsequent defeat at the Battle of New Orleans, the British East India Company began to ship opium by the ton into China. When the Chinese objected, the Brits attacked and burned down Peking. The consequences of that act are still being felt today. Pete: Thanks, that’s very interesting! Also, in my research I was surprised that opium was so widely accepted and traded. I thought it would be traded “under the table,” but the market was wide open! History doesn’t always repeat itself; sometimes it rhymes. The Brits were importing opium into China from Afghanistan an ancient primitive country that they occupied. Eventually the Afghans trounced the Brits, killing all of them except one doctor who was able to escape on a horse. Today, the poppy fields flourish, the opium derived from the poppy is transported via caravan to Persia (Iran) then sold as heroin mostly in Europe. For 17 years to the tune of many trillions of dollars, the USA has been trying to eradicate the poppy fields in Afghanistan while thousands OD from opiods here at home. Is this Iambic pentameter or is it just a babbling brook? Mr.Boyd, i am a fan of Mr.Cussler’s. You did an amazing job with this article. Would you mind providing an opinion on the USS Cyclops? What do you really think happened to her?